This sepia colored photograph shows the Atchison, Topeka and Santa Fe Railway Company depot, possibly located, in Wichita, Kansas. This photograph is also pictured in "Iron Horses of the Santa Fe Trail" by E. D. Worley with the caption "No. 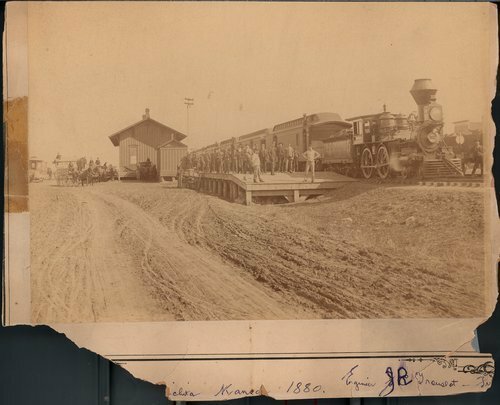 32, "Kansas," an 1872 Mason, is drawn up at Wichita, Kansas, station circa 1880. The crowd suggest that big and important things are underway.